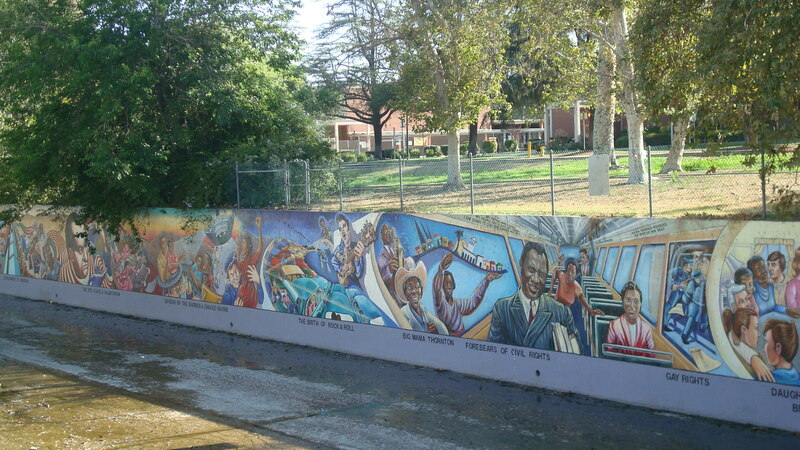 Around the middle of the twentieth century, over a period of decades, the LA County Flood Control District did their damnedest to encase most of the city’s waterways in concrete. Apparently it seemed like a good idea at the time. From our contemporary perspective, it looks like a colossal mistake. But what can we do? We don’t have the means to break up the hundreds of miles of concrete that were poured back in the last century. So we’re doing what we can, getting behind small projects that we hope will eventually have a cumulative impact. I’ve lived in LA all my life, and it still amazes me how little I know about this city. The Tujunga Wash runs from the San Gabriel Mountains, across the San Fernando Valley and feeds into the LA River around Studio City. Recently I started paying attention to the stretch that runs along Coldwater Canyon between Burbank and Oxnard. What I found was pretty interesting. 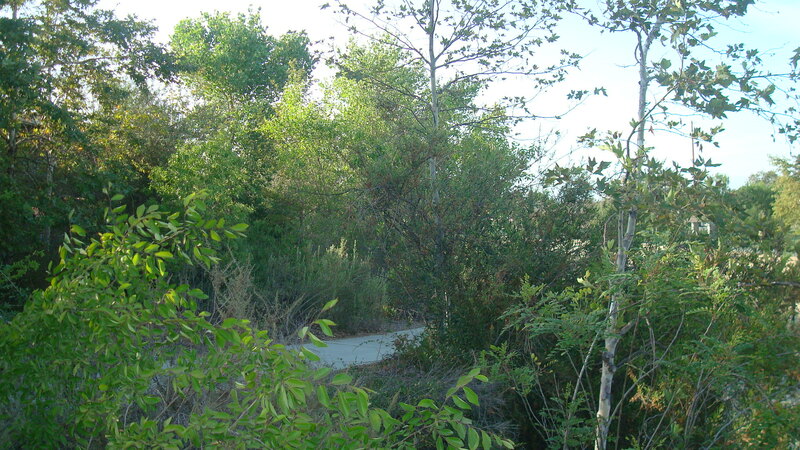 Above Oxnard, I found the Tujunga Wash Greenway and Stream Restoration Project. What used to be a drab stretch of land running alongside a drab stretch of concrete has been transformed into a lush green walkway which helps to replenish our groundwater. For a better explanation than I could give, click on this link to a page at the Landscape Architecture Foundation. They also provide before and after pictures to give you a sense of how dramatic the change has been. Below Oxnard, I found the Great Wall of Los Angeles. This is a massive, amazing public art project which presents a history of Los Angeles starting with the first people who lived in the area and ending in the fifties. 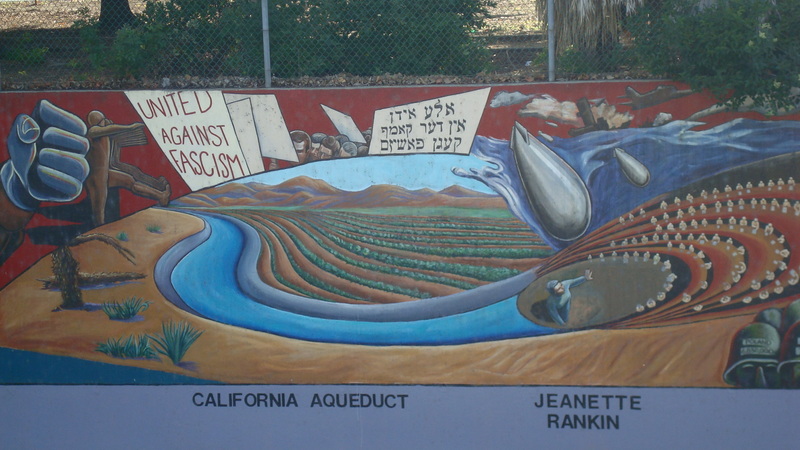 The project is the brainchild of Judy Baca, founder of the Social and Public Art Resource Center (SPARC). 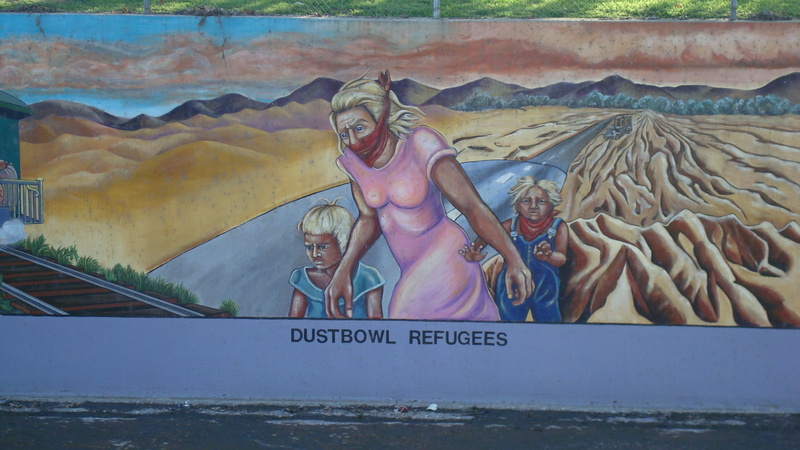 It was begun in the seventies, with over 400 young people and their families working over five summers to create the mural that currently covers a half mile of concrete inside the Tujunga Wash. 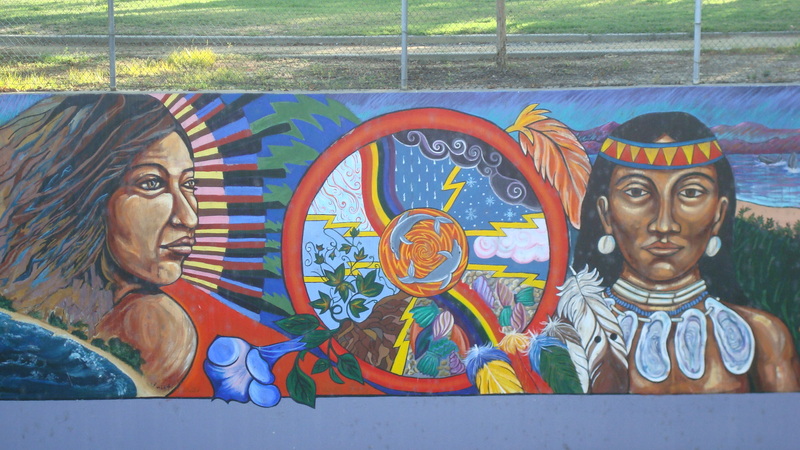 The mural starts with images of the Chumash Indians. 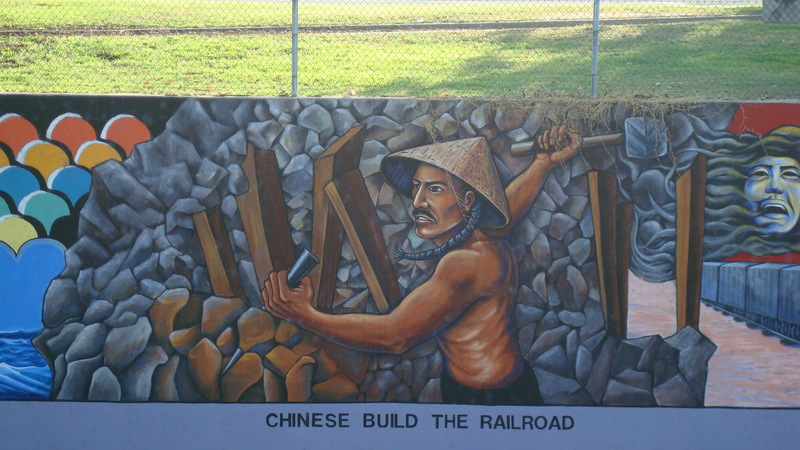 It covers the construction of the the massive projects that helped build the city, like the railroads…. It illustrates the multiple waves of migration the populated the area. 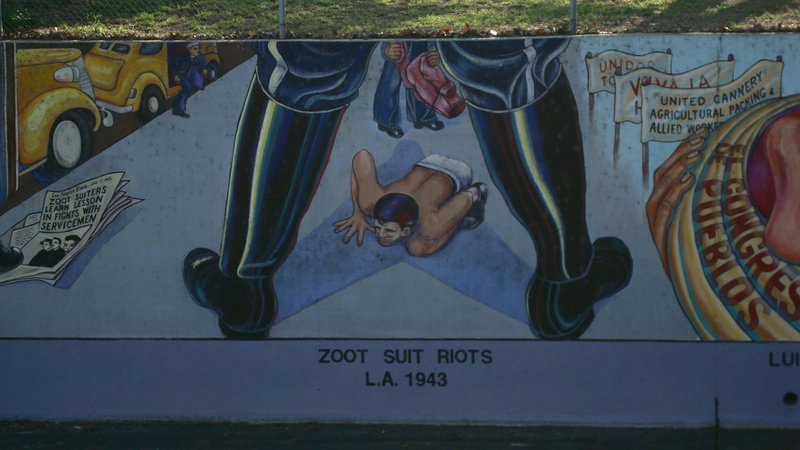 There are images of the traumatic upheavals that shaped LA. 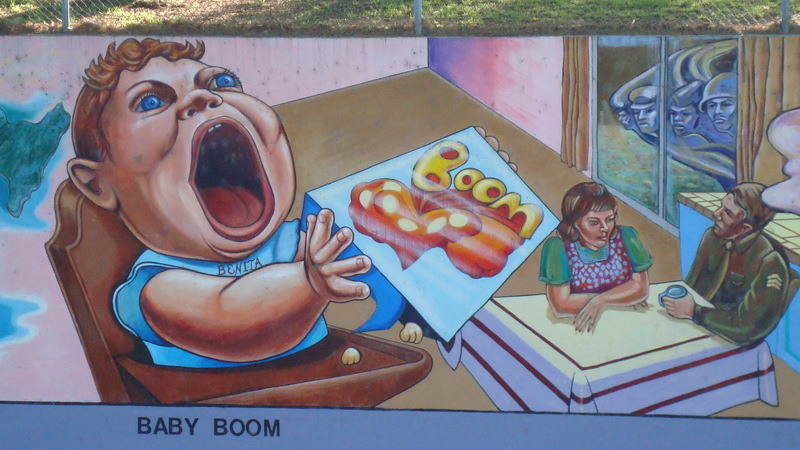 It takes us through the baby boom…. 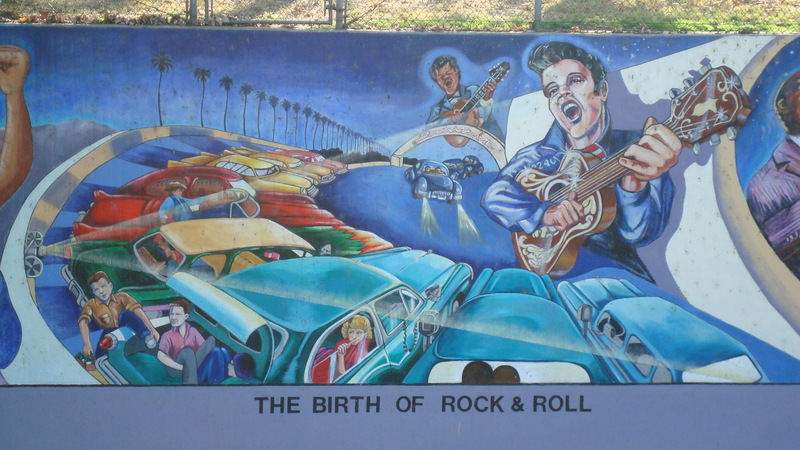 ….and the beginnings of rock n’ roll. There are plans to paint another four decades, which would bring the project up to the end of the twentieth century. For more information, and to find out how to donate, visit SPARC’s web site. 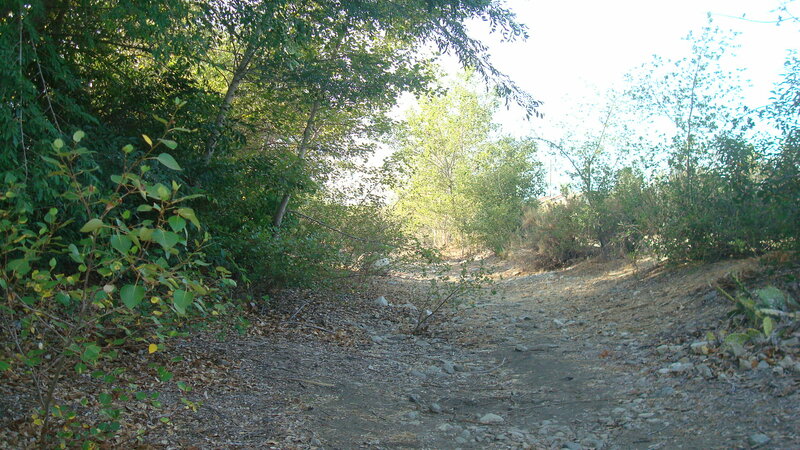 You won’t find much water in the Tujunga Wash these days. But you will find some other things that are worth checking out. A few months ago a friend and I were going down Forest Lawn Drive near Griffith Park. While she drove I was gazing out the window, and I was surprised to see a huge construction site spread out across the bed of the LA River. I hadn’t heard anything about a project planned for that area, and at first I was alarmed. What the hell were they doing to the river? After investigating a little, I found out that this was the Headworks Reservoir, and it involves the construction of two huge underground containers which will hold 110 million gallons of water. 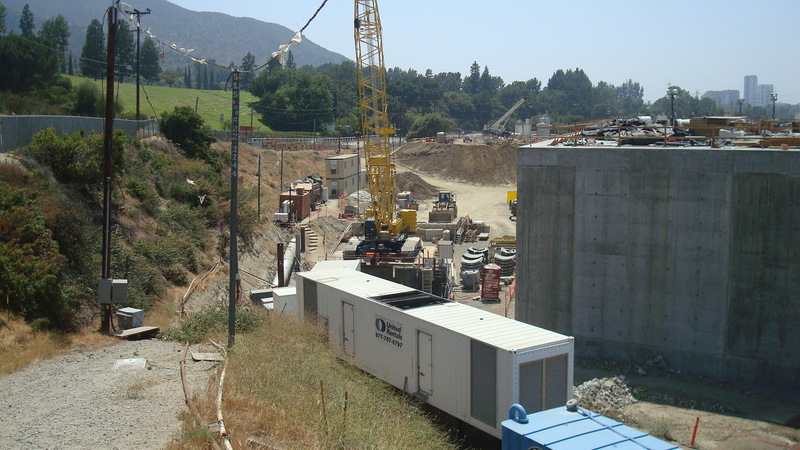 The idea is that when the project is completed it will provide drinking water to area residents who are now served by the Silverlake reservoir complex. In large part this effort was spurred by new rules handed down by the Environmental Protection Agency. Open reservoirs, like those in the Silverlake complex, are subject to contamination from many different sources. 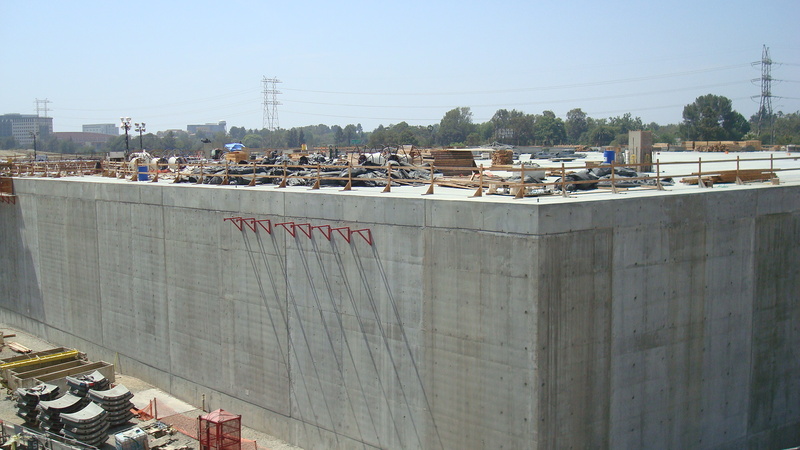 The Headworks project will comply with the new EPA rules and provide safe drinking water for thousands of Angelenos. Aside from improved water quality, the deal includes a 4-megawatt hydroelectric plant to provide more power for the city. And if that’s not enough, once the tanks are completed there are plans to turn the surface area into a park which would include riparian wetlands, bike paths and equestrian trails. There are some questions about the cost of the project and the process that was followed to make it happen. The City of LA initially said the price tag would be $230 million. That figure has now risen to $319 million. Those who follow local news already know that the DWP has been accused more than once of scamming its customers. The fact that the tab for Headworks has gone up almost 40 percent is definitely troubling. There are also questions about why the City chose this option when there were other, cheaper proposals on the table. If you’re a DWP ratepayer, you’ll want to read Jack Humphreville’s breakdown of the project on CityWatch. 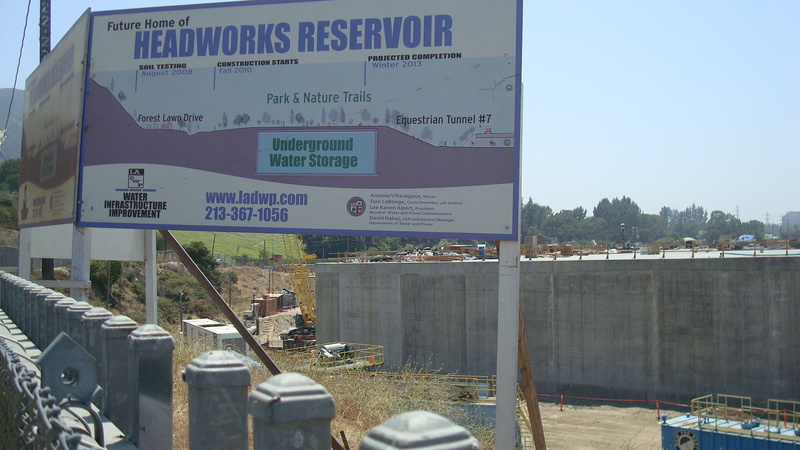 Is Headworks Project Another Example of Corruption? For a general overview of the project, here’s a summary from the DWP. Bottom line, the project is happening. And I do believe it’s a good thing over all. But it bothers me to think that we’re getting ripped off by the DWP once again. I’m glad Garcetti is pushing for an audit of the agency’s shady non-profits, but I’d really like to see a full audit of the DWP. We deserve to know where our money is going. 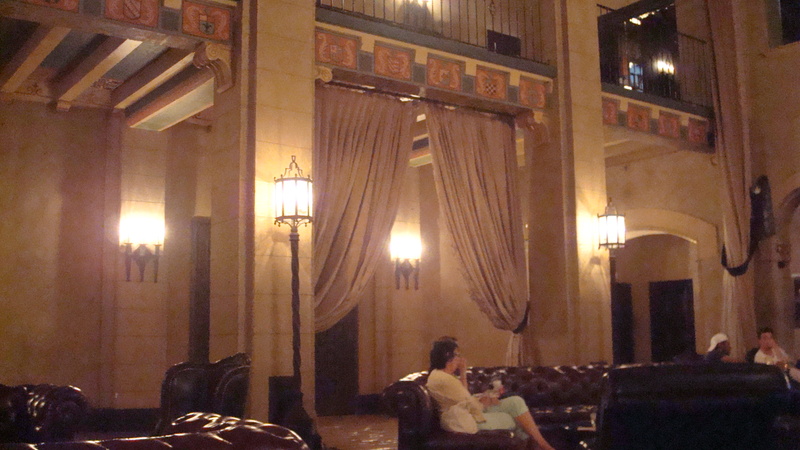 Another visit to the lobby of the Roosevelt Hotel. I used to like hanging out there back in the nineties because the lobby was big and dark and quiet. It was a great place to chill, in large part because it was usually pretty empty. Since then it’s been remodelled, and they’ve managed to attract a young, hip crowd, so the place is a little more lively these days. I’m glad they’re doing more business, but I spend less time there now. The photos were taken recently, and while the lobby is substantially the same, it has changed some in the past fifteen years. And as I’ve mentioned before, in transcribing these entries from my journal I’ve left the errors alone. The correct spelling for the name of the hotel is “Roosevelt”. Today I was on Hollywood Boulevard. I think it was around four o’ clock. And I decided to go to the Rooseveldt. Have a beer. Kick back. It’s been a while since I stopped in there. The lobby was pretty empty. I walked up to the bar. Ordered a beer. Then strolled over to the table by the piano and sank into a big, soft chair. It was so nice. So quiet. 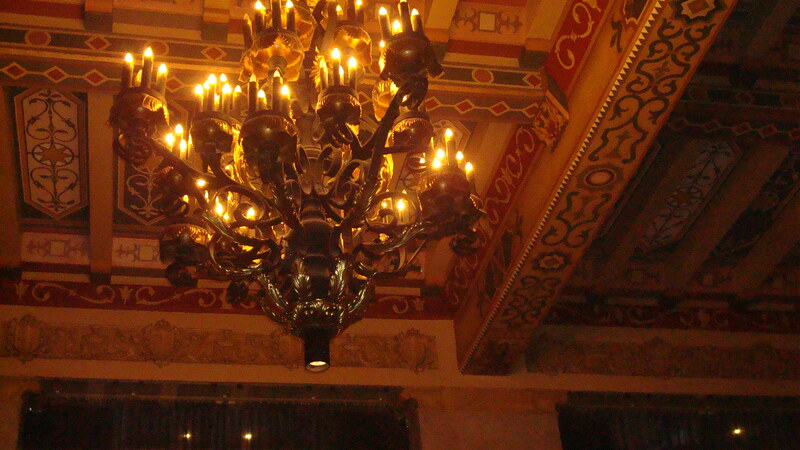 I sat there looking at the patterns on the ceiling. I finished my beer and thought, what the hell, why not have another. The guy comes in to play the piano. I ask him if he knows any Mancini. He says not a lot. I mention Charade. No dice. He throws out a few titles. Pink Panther. Baby Elephant Walk. I’m disappointed but I settle for The Pink Panther. There are quite a few people in the lobby by now. A man with a cell phone sitting across the table from me. At the next table over a woman reading a paperback. And there are a couple of guys sitting to my left. One of them is talking about Barry Fitzgerald. He’s trying to name movies Fitzgerald was in. The man with the cell phone jumps into the conversation. He offers Going My Way. Then he says Ten Little Indians. I want to correct him, he’s thinking of And Then There Were None. But these days I’m reluctant to start chatting with strangers. So they go on talking. The guy who was going on about Barry Fitzgerald says he works in movies. I think he said either as an actor or a stunt man. The guy with the cell phone says he’s a producer. In the exchange that follows I’m obviously not setting down what was said verbatim. I’m just trying to give an outline of the conversation. At this point I can’t restrain myself. You produced The Buddy Holly Story? I say. I liked that movie. I never thought it’d make any money, the producer says. What else did you make? That was a cool movie. Who was in Diner, asks the actor. Oh, wow, a lot of people. Mickey Rourke. And Kevin Bacon, says the woman with the paperback. Now I know there are a lot of people in this town who will claim to have produced, directed, written all sorts of famous films. Who knows if this guy was legit. But I think I was on my third beer by that time and obviously not feeling very skeptical. The guy probably could’ve said he produced Dinner at Eight and I would have believed him. The conversation moves on to other subjects. Italian food in New Jersey. Mexican food in LA. I ask the pianist for something by Gershwin. He plays Someone to Watch over Me. I felt pretty good when I left.